I will update this over the next 24 hours as I add more. I used Easel.ly and chose the embed function under the share/view option to put in a blog post. “Biotech crops currently available and in development, 2006.” Genetics and Genetic Engineering. Barbara Wexler. 2009 ed. Detroit: Gale, 2010. Information Plus Reference Series. Gale Opposing Viewpoints In Context. Web. 12 Feb. 2013. “Introduction to Genetically Engineered Food: At Issue.” Genetically Engineered Foods. Ed. Debra A. Miller. Detroit: Greenhaven Press, 2012. At Issue. Gale Opposing Viewpoints In Context. Web. 12 Feb. 2013. Pascalev, Assya. “Agricultural Ethics.” Encyclopedia of Environmental Ethics and Philosophy. Ed. J. Baird Callicott and Robert Frodeman. Vol. 1. Detroit: Macmillan Reference USA, 2009. 23-28. Gale Opposing Viewpoints In Context. Web. 12 Feb. 2013. “Public awareness among Americans, Canadians, and Britons of genetically modified food, 2005.” Genetics and Genetic Engineering. Ed. Barbara Wexler. Detroit: Gale, 2010. Information Plus Reference Series. Gale Opposing Viewpoints In Context. Web. 13 Feb. 2013. Schelmetic, Tracey. “Genetically Engineered Foods Have Not Been Proven to Be Harmful.” Genetically Engineered Foods. Ed. Debra A. Miller. Detroit: Greenhaven Press, 2012. At Issue. Rpt. from “Public Perception—Not Science—Will Rule the GM Food Debate.” Thomas Net News. 2011. Gale Opposing Viewpoints In Context. Web. 13 Feb. 2013. 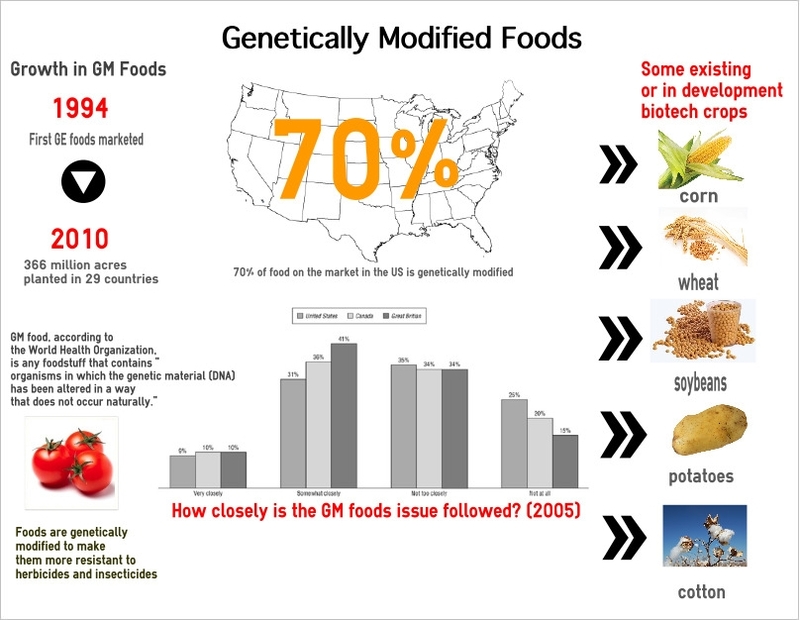 Tags: genetically modified food, infographics, information visualization. Bookmark the permalink.